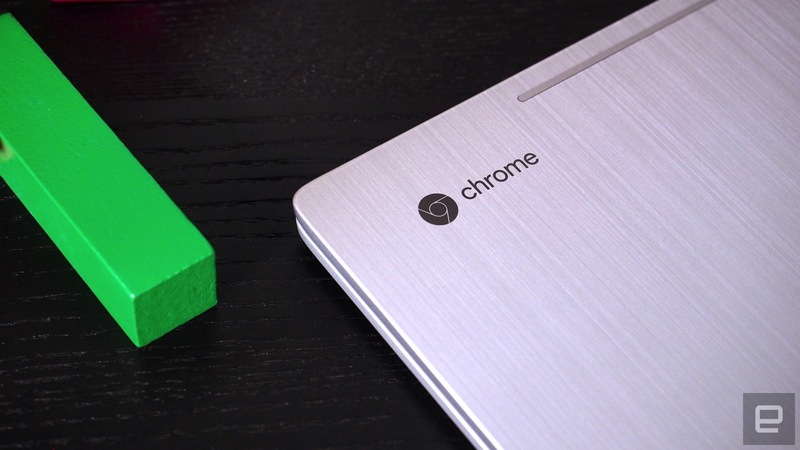 Recommending a Chromebook that costs more than $500 is tough, even if it's really good. Just over a year ago, you basically had two options for buying a Chromebook: Spend $999 on Google's excellent but overpriced Pixel or buy an inexpensive laptop that was inevitably compromised in one way or another. That's starting to change, however. Dell's Chromebook 13, which launched last fall, proved you could pack a sharp screen and keyboard into a device with strong performance and battery life. It was a bit pricier than the competition, but a little extra cash was well worth the upgrades. Now HP is taking the idea of a "premium" Chromebook to the next level with the new Chromebook 13. It starts at $499 and can be configured up to a whopping $1,029. That cash gets you a much thinner and lighter design than Dell's Chromebook, along with one of the best screens on the market. After spending some time with HP's latest Chromebook, there's no doubt it's an excellent machine. 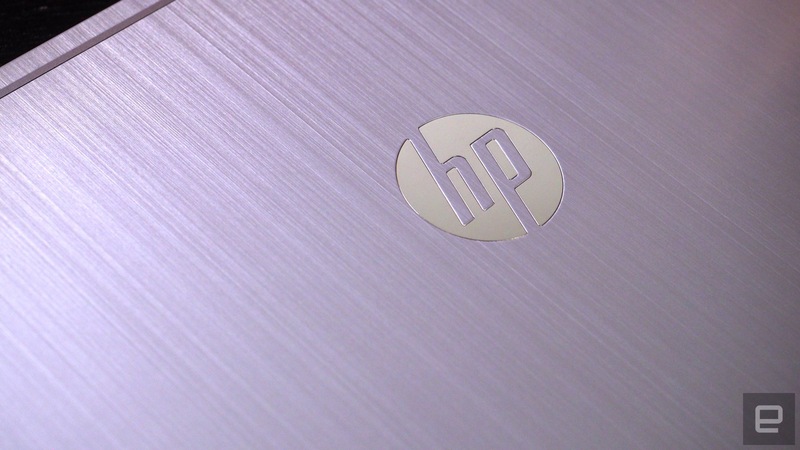 The question is whether it (or any Chromebook, for that matter) is worth HP's asking price. 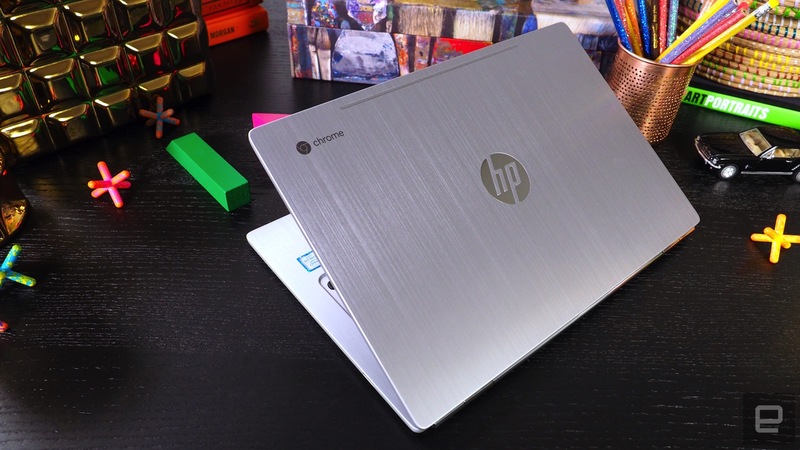 The HP Chromebook 13 is one of the best Chromebooks available, but it comes at a cost. 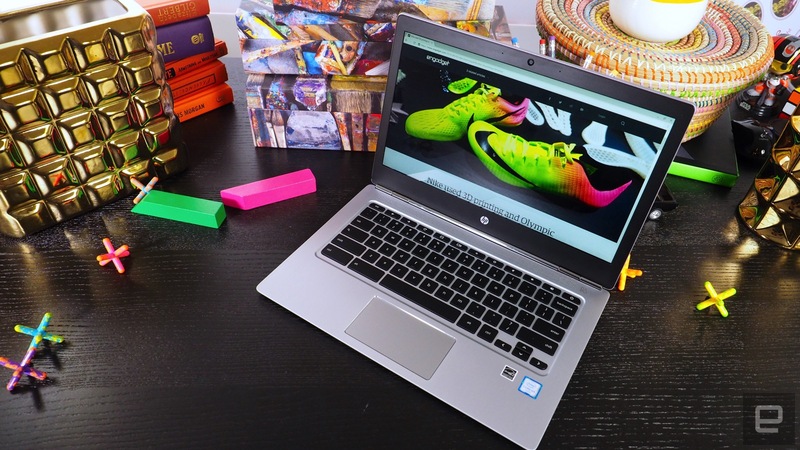 Though HP’s latest is a joy to use, a less expensive Chromebook will suit most consumers just fine. 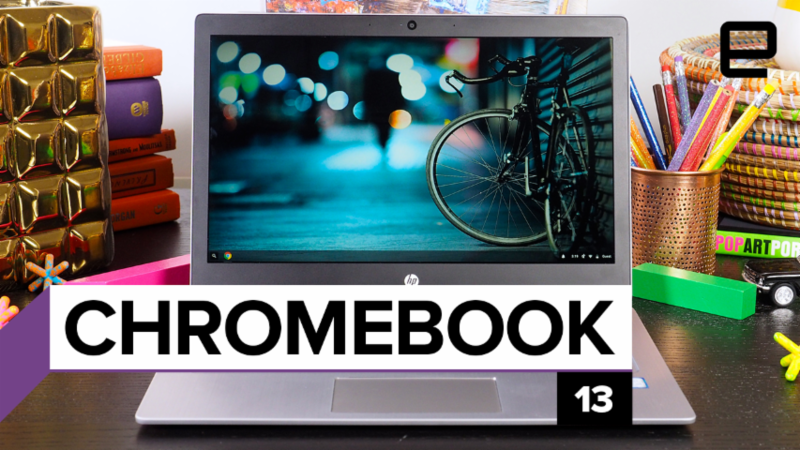 Be the first to review the Chromebook 13? Your ratings help us make the buyer’s guide better for everyone. There's no question in my mind that HP hit it out of the park with the Chromebook 13's design. It's the nicest Chromebook I've used outside the Pixel, which still costs significantly more than HP's offering. Visually, the Chromebook 13 sticks pretty close to the MacBook Air stylings that continue to dominate the industry. However, a few design notes, including its brushed-metal texture, black screen border and shiny chrome accents (including an overly large HP logo on the cover), lend it some unique visual flair. It's a nice-looking laptop, if a bit plain and derivative -- something that'll probably help it as a machine targeted at business customers. It's no Spectre 13.3, though. At 2.85 pounds and half an inch thick, it certainly has a lot in common with the many popular thin-and-light laptops available, and that's a place where it diverts from the similarly business-targeted Dell Chromebook 13. That computer is as solid as a rock, but it's a lot thicker and heavier than many other 13-inch laptops. The HP feels much more portable -- but it's not nearly as solid as the Dell. It's easy to flex the screen and chassis if you're so inclined. The screen flexing is particularly noticeable; my co-workers were pretty stunned at how easily I was able to bend the display. Obviously, this isn't normal behavior, but it does make me concerned about the laptop's long-term durability. Fortunately, the HP Chromebook 13 felt solid and comfortable in normal use. It's just not the tank that Dell's Chromebook is. Indeed, for real-world use, the HP feels great from the moment you open it up. You can easily lift the screen open with one hand; the body of the computer stays put and doesn't wobble on your lap or desk when you're adjusting the display. And what a display it is: The 13.3-inch screen has a best-in-class 3,200 x 1,800 resolution. (You can also save some cash by stepping down to a 1080p panel.) By default, it's scaled to an effective 1,600 x 900 resolution, but thanks to the pixel density, you get super crisp, readable text and wonderfully detailed images. And for me, 1,600 x 900 is a sweet spot in terms of having a large workspace and text that isn't too tiny. 1080p feels a bit small to me on a display like this, but if you want more space, there are plenty of scaling options in the Chromebook's display settings. I have a couple big complaints about the display, though. After using the Pixel, I've grown to love having more vertical real estate; HP's Chromebook 13 feels a little cramped in this regard. It doesn't help that the bezel at the bottom of the display is particularly thick: It feels like a 16:10 panel could have fit here without an issue. Of course, basically every computer out there has a 16:9 display aspect ratio, so this is hardly HP's fault. More damning is the lack of a touchscreen. With Android apps coming to Chromebooks soon, there's finally a good reason to have a touch panel, and it should be a default feature on an $819 computer. I could understand it being left off cheaper models in the lineup, but it should at least be offered as an optional upgrade. And while the viewing angles on this screen aren't bad, it's not an IPS display, so you won't get the wide field of view that some other notebooks offer. Despite these few complaints, the screen is a high point. It's about the best I've seen on a Chromebook. That should be the case for an $820 machine, but the fact that you can get the same display on a $500 version of this laptop is a big win. Beyond the screen, the keyboard and trackpad are of utmost importance, and fortunately HP got both of these things right. I've been happily typing away on this computer for over a week, and it feels nearly as good as the Chromebook Pixel and equally as comfortable as the Dell Chromebook 13. There's an adjustable backlight here, which feels appropriate for a computer in this price range, and the keycaps offer decent travel for a computer this thin. As for the trackpad, the only complaint I have is that, similar to the screen, I wish it were a bit taller. Other than that, it works fine. I'm glad to see laptop manufacturers starting to get touchpads consistently right. 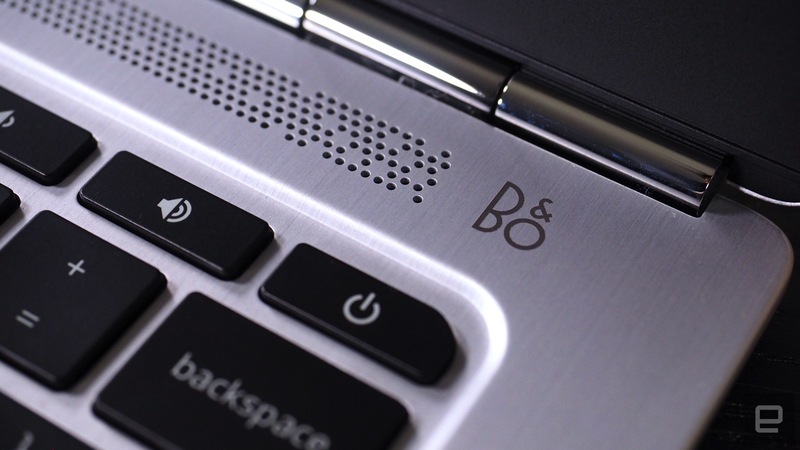 HP touts stereo speakers from Bang & Olufsen, and while there's only so much you can do with speakers in a smallish laptop, these sound pretty good to me. They're not any louder than your average notebook audio setup, but they're definitely crisper and less muddy than on most other computers. You're still probably better off listening with headphones, but in a pinch these will do -- just don't expect any physics-defying sound here. As for ports, the HP Chromebook 13 keeps things pretty minimal: There's one USB 3.0 connection, a headphone jack, two USB Type-C sockets (either of which can be used for charging) and a microSD slot. I'm confounded by laptop makers that insist on microSD; a full-sized SD reader would be far more useful for most people. Having two USB Type-C ports is smart, though: You can dedicate one to power if need be and still have options for plugging in more devices, including the HP docking station designed specifically for this laptop. HP's Chromebook 13 is the first Chromebook I've tried that uses Intel's newest generation of Core M processors. The $819 model I tested has a 1.1GHz Core m5 processor paired with 8GB of RAM and 32GB of storage space. We'll talk more about whether this computer is worth that kind of cash, but for now, the most important thing to know is that HP is offering this computer in a variety of configurations. The base $499 model pairs a Pentium 4405Y processor with 4GB of RAM; $599 steps that up to the Core m3-6Y30 processor with the same RAM allotment. If you're feeling particularly crazy, you can upgrade to a Core m7-6Y75 processor with either 8GB or 16GB of RAM. HP says you can get that top-of-the-line model from "select retailers" for $1,029. However, I only had the $819 model to test. At that price (more than nearly any other Chromebook on the market), I was expecting a great experience, and fortunately I was not disappointed. Anecdotally, I was able to run all of my usual apps (Inbox, Chrome, Google Play Music, TweetDeck, Slack, Keep, Docs, Wunderlist, Hangouts) plus more than a dozen tabs with few hiccups. Music would occasionally cut out slightly, and typing text in Keep felt a bit laggy while I was simultaneously doing a video call, but by and large I have no complaints about the performance. And from a benchmark perspective, the Chromebook 13 kept pace with the best you can get when running Chrome OS, including the Pixel. *SunSpider and Kraken: Lower scores are better. I will say that I've had one big issue that I can't overlook, and that's the battery life. HP claims that the Chromebook 13 gets 11.5 hours of runtime, with a big caveat: You need the model with the 1080p screen to achieve that result. HP doesn't offer any estimates for the 3,200 x 1,800 screen I've been using, but I only got about 6 hours of battery life doing my normal work routine. This is a major disappointment, especially after enjoying incredibly long battery life on Dell's Chromebook 13. HP's machine is smaller and has a sharper, more power-hungry screen -- but getting significantly less than eight hours of battery life is a serious bummer. Our battery test (which involves looping an HD video with screen brightness fixed at 65 percent) bore similar results: The HP Chromebook 13 lasted for 6 hours and 33 minutes. And unfortunately, the computer didn't charge as quickly as I'd hoped, despite HP touting USB Type-C's quick-charging features. It took about two and a half hours while in use to go from nearly dead to 100 percent and a good 90 minutes to get to 50 percent. None of this matters if Chrome OS doesn't have the apps and services you need to get things done. Fortunately, as I wrote last fall, Chrome OS is pretty capable right now. There are tasks like photo and video editing that the platform is still not suited for, but for the majority of consumers, using a Chromebook might increasingly make sense. I rarely felt like I was hamstrung when using HP's Chromebook 13, and the Android apps coming this fall will make the platform even more capable. It's still worth making sure what you typically do on a laptop is feasible with a Chromebook, but Google has closed the feature gap in the past few years. As I've mentioned multiple times by now, Dell's Chromebook 13 is the computer most worth comparing to the HP Chromebook 13. HP's model is the clear winner in terms of design and display, but the Dell counters with a much lower price and far better battery life. Dell also has a variety of configurations: You can step up to a full Core i3 processor, increase the RAM to 8GB and add a touchscreen. If you're interested in HP's Chromebook 13, I'd encourage you to also check out the Dell before making a final decision. Unless you really love the HP's more compact design or its super sharp screen, the Dell wins on bang for your buck. There aren't a lot of other Chromebooks that have excellent screens, keyboards, performance and design. The Chromebook Pixel is one, of course -- but at $1,299, there's no way we can recommend that computer to most normal humans. Toshiba's 13-inch Chromebook 2, released in 2015, is still a strong choice. About $340 gets you a 1080p display, decent construction and an Intel Core i3 processor. The battery life on that laptop isn't outstanding, but performance will not be a problem. Most other Chromebooks beyond these are compromised in one way or another: cheap construction, small or low-resolution screens, or -- worst of all -- bad processors leading to poor performance. Similar to the Chromebook Pixel that appears to have inspired it, HP's Chromebook 13 occupies an odd spot in the market. As tested, it's hard to recommend anyone spend $819 on this laptop. It packs a wonderful screen and keyboard into a thin and light package, and it combines that with solid performance. But the battery life isn't great, and $819 is still too much to spend on a Chromebook. Yes, they're better than they ever have been, and they're going to get a lot more useful this fall when they start supporting Android apps. But even as someone who has wanted a "premium" Chromebook option beyond the Pixel for a long time, I can't justify the cost of this computer. Fortunately, HP is making two models that are cheaper than this one. You can still get the same great package, just with less RAM and a slower processor, for the much more reasonable price of $499. I haven't tested that machine yet, so I can't give it a full-throated recommendation yet. 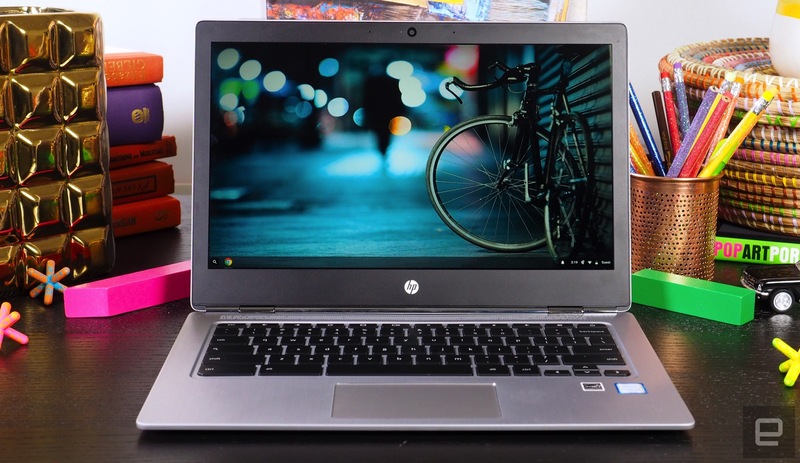 But if you've been searching for a Chromebook with premium build quality like I have, it might be worth seeing if the cheaper versions of HP's Chromebook 13 can meet your needs.